Report brings to light challenges of health-care decision-making and the legal rights of people living with dementia | Alzheimer Society of B.C. 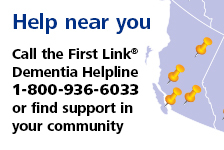 The Canadian Centre for Elder Law (CCEL) and the Alzheimer Society of B.C. released a report aimed at respecting the rights of people living with dementia when it comes to health-care decision-making. Conversations about Care: The Law and Practice of Health Care Consent for People Living with Dementia in British Columbia reflects over two years of research and consultation and makes recommendations for changes to law, policy and practice. The report contains 34 recommendations that address law reform, access to justice and legal aid, public and health-care professional legal education and systemic barriers to informed consent, such as physician-billing and access to language interpretation. The recommendations were developed with a 15-person interdisciplinary advisory committee after consulting with people living with dementia, family caregivers, health-care professionals and other key stakeholders from across B.C. The Alzheimer Society of B.C. collaborated with the CCEL throughout the development of the report by organizing focus groups of people affected by dementia to give their input into the report, as well as providing photography and ongoing consultation. The full report, as well as a short, plain language version of the report, can be downloaded from the CCEL website at www.bcli.org/ccel.